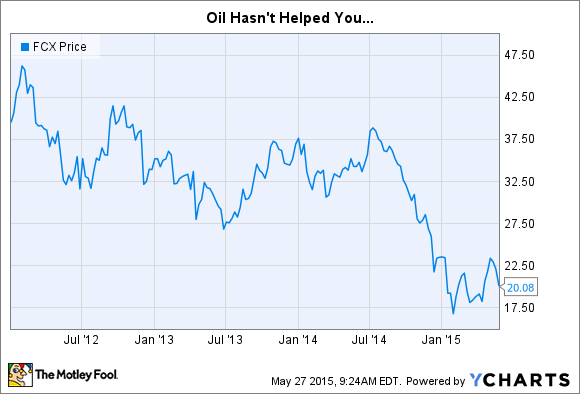 Freeport McMoRan's push into oil now looks like a disaster, but how bad is it? Freeport-McMoRan Inc (NYSE:FCX) is one of the world's largest copper miners. However, a few years ago, it made a move into oil. That looks like an ill-timed decision at best now that oil has sold off in dramatic fashion. Just how much of your shareholder value was destroyed? In 2013, Freeport acquired McMoRan Exploration Co. and Plains Exploration for roughly $9 billion plus the assumption of around $11 billion of debt. The impact was pretty material. For example, over the course of 2013 the company increased debt by $16.5 billion, issued 50 million shares, and burned through roughly half of its cash pile. In other words, this was truly a transformational move for Freeport. Some industry watchers have argued that it had little choice but to buy the two oil companies, in which it had small ownership stakes, in order to salvage its investments. But that doesn't change the impact it had on Freeport's finances. 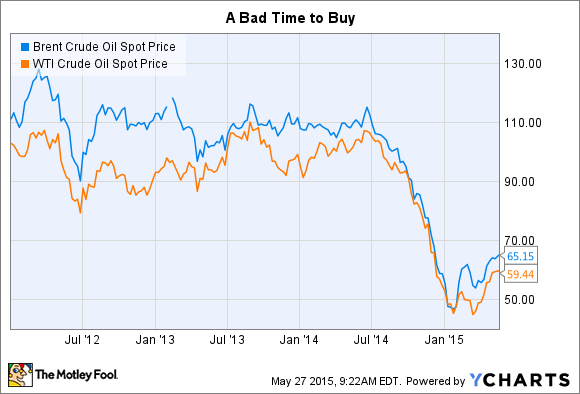 While oil was holding at lofty prices, the move was expensive, but not awful. That all changed when oil prices plummeted starting in mid-2014. So far, Freeport has written off around $5.4 billion of these deals. That's made up of a 2014 impairment charge of $3.7 billion for oil still in the ground and $1.7 billion of goodwill. If oil prices rebound, the asset impairment will turn out to be less meaningful. However, goodwill refers to the amount a company pays for an acquisition that exceeds the value of an acquisition's assets. Writing that down is basically admitting that you overpaid. Using the $20 billion total price tag, Freeport's goodwill writedown is a touch under 10% of the bill, but if you exclude the assumed debt, Freeport wrote down nearly 20% of the acquisition price. "Oops" would be an understatement, particularly since the company has already warned that more write-offs are on the way: "the effect of weaker oil prices than the 2014 average is expected to result in significant additional ceiling test impairments of our oil and gas properties during 2015." So, there's more pain to come. That said, goodwill impairments and asset write downs don't impact cash flow or day to day operations, but they do reduce shareholder equity, which fell over $2 billion last year. What's this done to you? So, how bad is this? Investors now own a much weaker company. For example, last year, balancing out investments and dispositions, Freeport used roughly $3.8 billion for its capital investment activities. Approximately $3.2 billion of that went to oil, more than any other single area. And, worse, the company spent more than it made, burning through another $1.5 billion in cash, bringing its cash hoard down to less than $500 million. To be fair, the company reduced debt by around $2 billion during the year. But that's not enough of a dent, and its steadily shrinking cash account is a big risk. That helps to explain why Freeport issued roughly $2 billion of debt in the first quarter, using $800 million to pay down older debt, adding about $85 million to its bank account, with the rest going toward capital spending where oil was, once again, the most costly line item. And now, to add insult to injury, Freeport has been talking about possibly spinning off a part of the oil unit to help pay for drilling, basically admitting that the oil unit isn't holding its own. And don't forget that your dividend went from $0.3125 a share in the fourth quarter last year to a measly $0.05 a share in the first quarter of this year. That big oil bill is really coming due! Until Freeport figures out the oil mess it's gotten itself into, investors should probably stay on the sidelines. And at this point, even a rise in oil prices may not be enough to salvage the situation.